We are excited to introduce to you the new Cat Walk Tote and Accessories from Triple T Studios. This vegan friendly trio was designed by us and is made exclusively for us. We wanted to create an elegant tote and accessories that are practical but with a bit of added whimsy . We hope you like them too. 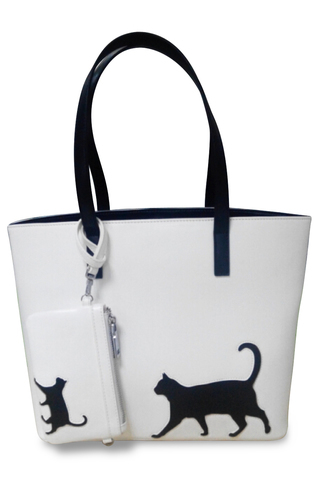 The Cat Walk Tote features a happy cat walking with their tail up and curled! 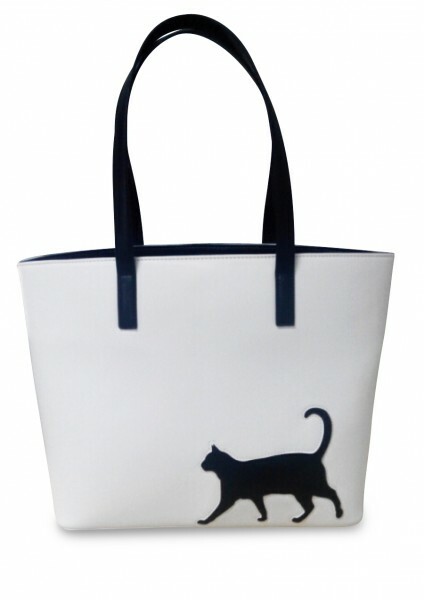 The black cat stands out against the winter white tote. 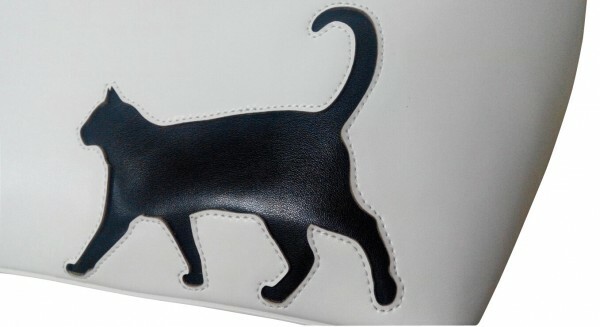 The cat is carefully stitched in place for not only a high-end look but for durability. 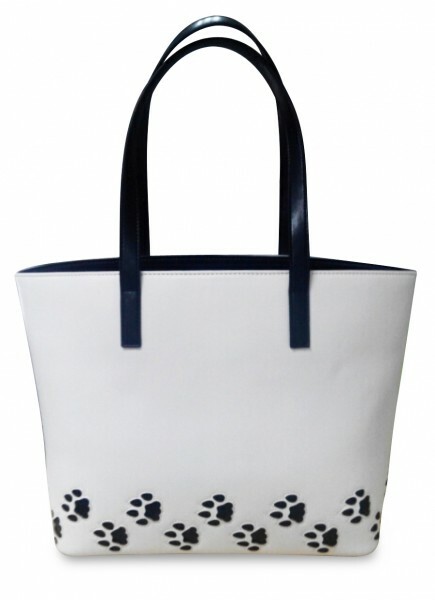 The back of the tote features a whimsical trail of cat paws creating a pretty pattern across the bag. 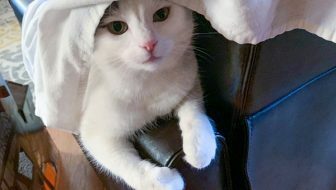 The cat paws are carefully stitched in place too. We like to be hands free sometimes when we are out and about so we created the Cat Walk Phone Cross-Body Bag just the right size for your phone, cards, and basic essentials. This versatile bag come with no only the generous 60″ cross-boy strap but an additional wrist strap for those times you might want to loop the bag around the strap of your Cat Walk Tote or your wrist. One member of The Tiniest Tiger community will receive one Cat Walk Tote, one Cat Walk Cosmetic Bag and one Cat Walk Phone Cross-Body Bag. 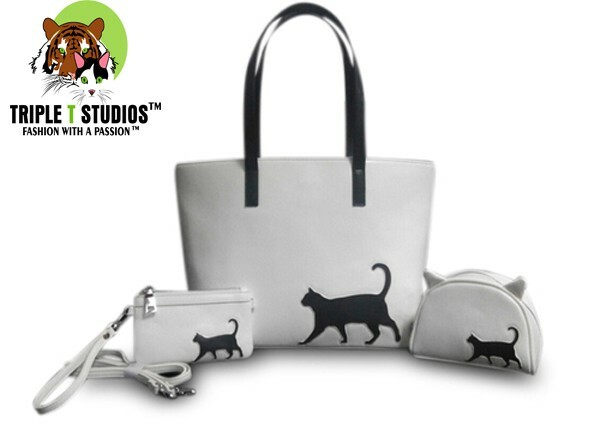 If you can’t wait, you can learn more about the new Cat Walk Tote Trio here Triple T Studios. Leave a comment below this post telling us: What do you like the most about the new Cat Walk Tote and Accessories? These items are flat out cute!!!!! and appeared well made. This is a really cute tote bag. I love the black kitty on the white background. Classy and cute! Thanks. I love the Cats and the paw prints on them I have 3 cats so I am a cat person and these are great. I love the simple cat design. And I love the paw prints. I like its a fun design on the bag. 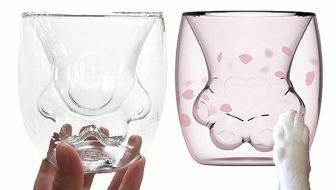 They are so cute and the cat design is nice and simple. The design is so cute. The stitching and everything looks well done. Love it so much! Oh my gosh, I love this! I love the black and white and the simple decorations on the bags. No big sequins or bling like what seems to be popular now days. Thanks so much for the opportunity to win! I love the simple classy look of the silhouettes. I like that it’s very simple and classic looking. Definitely would match anything. I like the little feet prints. Elegant and not like a cartoon which is what most cat related product are offered. How can you not love such style and elegance! These will turn heads everywhere! Well done that designer!! This is very elegant and fun! I love the beautiful design! Cats are always so elegant looking! I just love this set, especially the make-up bag, because of the cute little ears! I love these bags. I just think they are the cutest thing ever. They are so pretty and the paws are hand stitched. Love the silhouette and they whimsy of the footprints tracking across the back. The black and white is classic. So cute and practical love all of them !! I love the design – simple and elegant! I am a proud crazy cat lady! If it’s got cats on it, I want it! 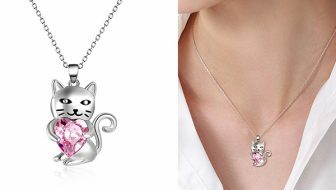 I would love to win these for my daughter because she absolutely loves cats. What’s not to like. Blackbird and paw prints, I have an affinity for both. I love the style, very spacious, in a sleek elegant look. If it comes in a storage bag like my refined tote did, it just makes it feel priceless. 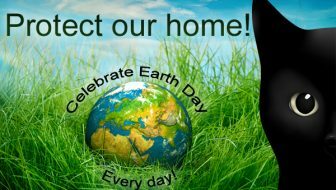 Just as our fur babies are. I love them because they have kittehs on them! I’m getting back into the work force and this would make a statement, plus its a beautiful I love it. They are so adorable, but still sophisticated enough that they don’t look like a child’s bag. You get three things for 24$ that is a super deal! ima gonna get one for my daughter. I love that you can get a matching set! These are soooo cute! I love the footprints on it, they’re so cute! I love all things cat! I am a cat lady. 🙂 I love the matching accessories with the bag. The paw prints are super cute! I like that all the accessories match the main tote bag. I also love how the cosmetic bag not only has paw prints on one side and a cat on the other, but it is shaped like a cat face with pointed ears. i like the footy prints! I love the black on white, I think it looks super stylish! Such a classy bag! I love the simple but elegant black & white combined with the whimsical cat. I’d use this often! I love the cute kitty pic and paw prints on the bags. So cute! So cute! I adore and have a cat Meeko 🙂 So this would be so amazing to have! I just love the paw prints and the cat design! I like how simple yet functional this design is. Lovely! This set is so beautiful. I’m sure I won’t win, but I will definitely order them when I get some extra money. 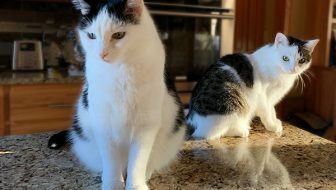 Beautiful collection that shows off our favorite pet CATS. I can express my love of pets with a these classic items with fun details. A great addition to my Triple T ‘collection’. I really need new bags and these are perfect for me..my favorite is the cosmetic bag with little kitty ears! I love the black on white contrast, plus how elegant and simple the pieces are. I also have two black cats!!! These reflect the talent of the designers, but even more, the special beauty of cats. saw where you are giving this away on Modern Cat today….i entered. i enter every friday to win things to donate to safe haven cat shelter and clinic but i would keep this for myself. love it. It’s classy looking. It shows you are crazy about cats, but not the stereotypical tacky crazy cat lady. Anything kitty – love it! I love the clean modern look and the coordinating patterns of this set. Looks very stylish! Great design! So clean and modern and fun at the same time. I love it! A love a roomy tote—and cats! I love the paw prints on the back! High end, durable, style and cats..a perfect combination! These are adorable. The design is just so cute especially the cosmetic bag! Everything, but especially the style and quality look of all three items. I am proud to profess my love for all cats, and these bags would certainly show how much I care. 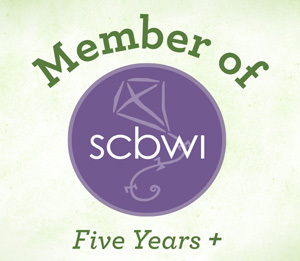 Congratulations Barbara!! You are the winner of the Cat Walk Trio! We will get your tote and accessories on the way to you asap. You will receive a shipping notification! Thank you for being a part of The Tiniest Tiger community. Thank you so much, Joanne! So thrilled to win the beautiful tote and accessories. Love all cats and all things cats! I like that is about cats, and it comes as a set. You can choose the right bag for the day. 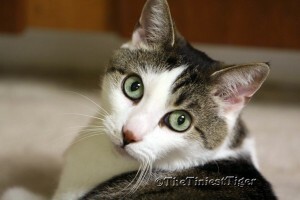 The cats of course make them awesome, but more so they are beautifully designed and awesome!! What do I like the most about the Cat Walk Totes? Well.. the cats on them, of course! I would proudly wear/use these everytime I go out. I like that you can have a matching set. The attention to detail is amazing! I love the paw prints on one of the sides which means it’s reversible. It’s not only cute, it is incredibly stylish as well! I love the design!! Beautiful and stylish. I love every piece of this set! Great design! 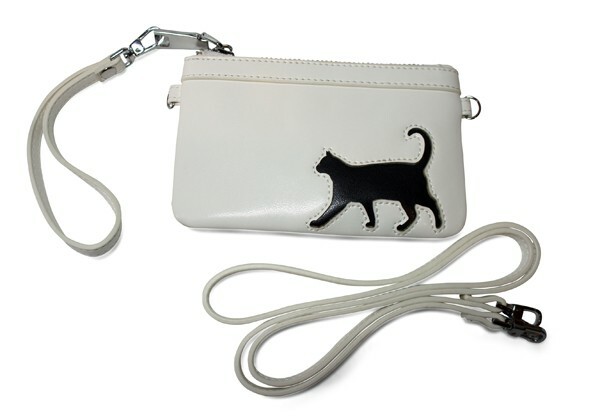 Cute cat tote and cross body bag would be great when you dont need the tote to carry a lot. these look nicely made with cute logos. I love this set. So stylish. I woul dbe proud to show it off! I am insanely in LOVE with this set!! 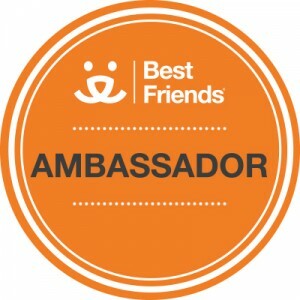 <3 It will allow me to show off my cat crazy loud and proud! For the love of cats!! It just makes accessorize so much more fun!! There are so many ways to mix and match, all the while repping my cat lady-ness! My old (very old!) purse broke, and these are just adorable ? I’m not usually a fan of bags and purses as most things are too gaudy and girly, but this is nice and simple and I love cats so it’s perfect! I love the classy simple look. The paw prints are adorable. Thank you for the chance. Great giveaway, i just love the trail of cat paws along the back! I love the cat design. I love the cute designs. The paw prints across the back. I love the look of this set, it’s something I’d love to show off! I just love how cute they are! Those ears on the cosmetic bag get to me. I love that cat walking across the tote. I love the classy look. This would be perfect to take along to our cat charity events and dinners. I love the clean design and that it’s sure to be a conversation piece! I like that it looks sturdy and strong enough to hold a lot of stuff. I love that they are so neutral and will go with anything. I also love the cat design. 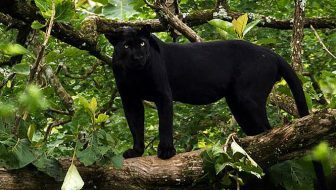 I have a solid black cat and this reminds me of him. I’m such a cat lover and these are so adorable. Thanks so much. I love the design, so classy and unique! I love this so much! I would be thrilled to have these and show them off to everyone! I love how classy and elegant they look while still showing off my catitude! I love that the set is adorable, yet still a little sophisticated. Very nice! I like that the bags are all adorable and very useful! I had a black cat and the tote reminds me of him. I like that the bag looks like leather. The little cat prints are so cute too. My wife would love this. They have black cats on them! Black cats are the best! They are so stylish and so expressive of my love of cats! Those little paws walking across the back just stole my heart, so cute! I love the kitty cat designs. It’s sleek and classy looking. I love the design, gorgeous unique set. I like the clean design and black/white coloring. They are all unique and different then anything else out there. I love them all, they are beautiful!! lt has such a simple, sleek design. It works with everything. I love the cat on one side & the paw prints on the other!! I really need a bag for my cell phone. The bag is so cute! I love the structure of the bag, the subdued colors mixed with whimsical designs, and the adorable ears on the cosmetic bag! 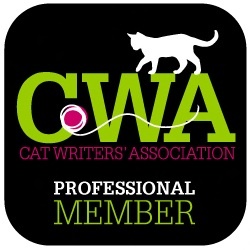 I LOVE the paw prints – It’s the cat’s MEOW (cliche’ I know – but it fits)…O.MEOW.G it’s PAWsome! I love the happy little cat, and the paws on the back too!! The new tote and accessories are SO adorable! I love the clean and simple look. Elegant! I love the beauty of the bag and the paw stitching is so cool! I like the clean, unfussy design. That tote bag is great! 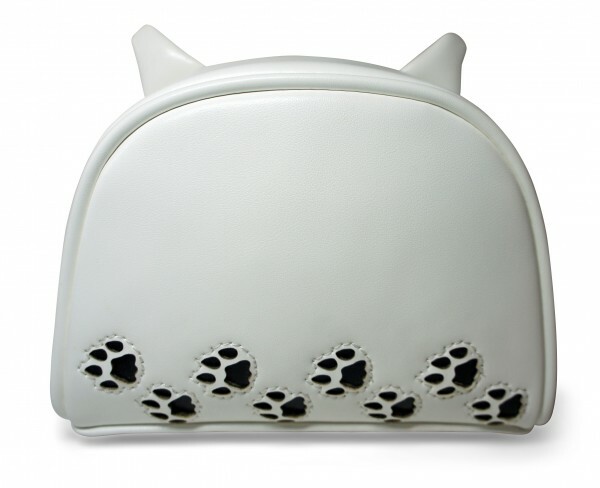 We love the attention to details…like the paws walking on the back side. I like the picture of the cat on front with the paw prints on back. I love the cute and simple design, and the short strap that will let you use the cross-body phone bag as a wristlet or attach to the tote. Beauty & charm all in one (and I love the paw prints on the back!). i like that they have kitties, yet are still refined enough for everyday use. These are especially pretty – so simple and graceful! I love the colors so crisp and clean, sophisticated looking. The cat’s meow! I really like the looks and also that it has everything you need to carry your stuff. I love the way it’s understated and clean and totally makes you think of cats. i love the paw walking along the bottom of the tote and the matching accessories. so cute. does it come in other colors, white get dirty so quickly. like the small purse/coin has wrist handle as well as long one too. love the ears on the cosmetic bag. Hi Sandy, We are thinking of making this trio in Black with white cat and paws too. The tote has protective feet on the bottom and this material is easy to wipe clean with a damp cloth. 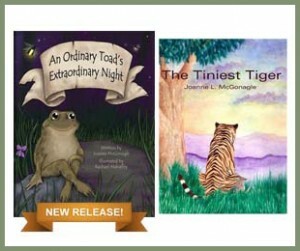 Thank you for being a part of The Tiniest Tiger community.